Every Friday, a DIY expert spares us a trip to the grocery store and shows us how to make small batches of great foods at home. Today: Tara O'Brady from Seven Spoons makes homemade ranch dressing in just three simple steps: mix, shake, and stir. I have personal rules when it comes to summer. I heartily believe all ice cream must be served in a cone, preferably sugar or waffle. Lemonade requires some pucker; if it’s too sweet, it’ll give you a headache on a hot day. Meals should be eaten outside as often as possible. And ranch dressing tastes best when shaken or stirred together in a mason jar. 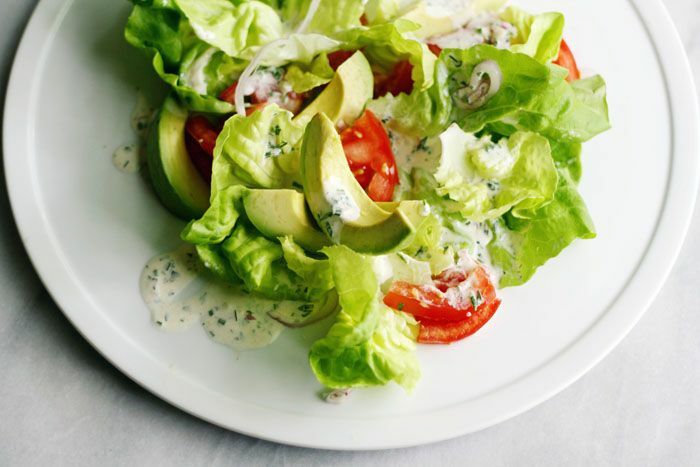 Ranch is a buttermilk- and mayonnaise-based dressing named after the ranch in Hidden Valley, California where it was first served almost 60 years ago. We don't eat it year-round in our household, but it’s in regular rotation every May through August. Ranch matches beautifully with summer produce: it's all I want drizzled on a plate of thickly sliced tomatoes, or as a cool dip for chubby field cucumbers. Grilled corn painted with ranch and dredged in grated Parmesan is addicting. Thicker versions also make a fine spread for sandwiches and hamburgers. My homemade dressing doesn't try to emulate store-bought versions, because if that’s what you’re craving, then only the original will do. Instead, I've come up with a tangy rendition, packed with herbs and with enough body to coat greens and vegetables without overpowering them. 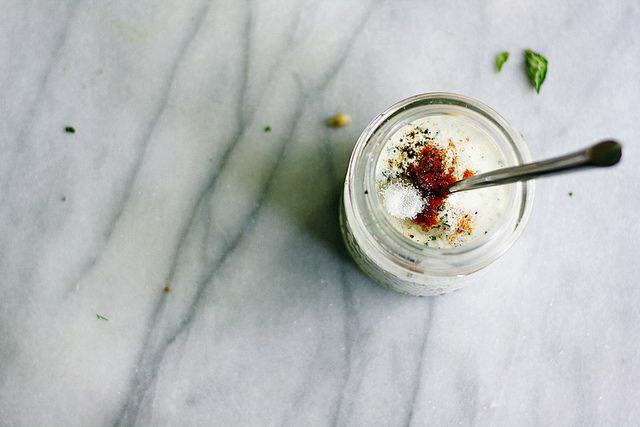 Yogurt lightens up the mix, basil brings extra fragrance and sweetness, and paprika lends a smoky note. It has quickly become a household favorite for us -- give it a try, and you'll soon be putting it on everything. In a jar with a tight-fitting lid, combine the shallot, herbs, garlic, vinegar or lemon juice, mayonnaise, and yogurt or sour cream. Screw on the lid and shake the jar to combine. Stir in most of the buttermilk. Check for consistency, and add more if needed. Taste, then season with salt, pepper, and paprika. If the dressing is too sharp, drizzle in some honey to mellow the acidity. Taste again, and adjust if needed. Cover and refrigerate for an hour before using so that the flavors can develop. 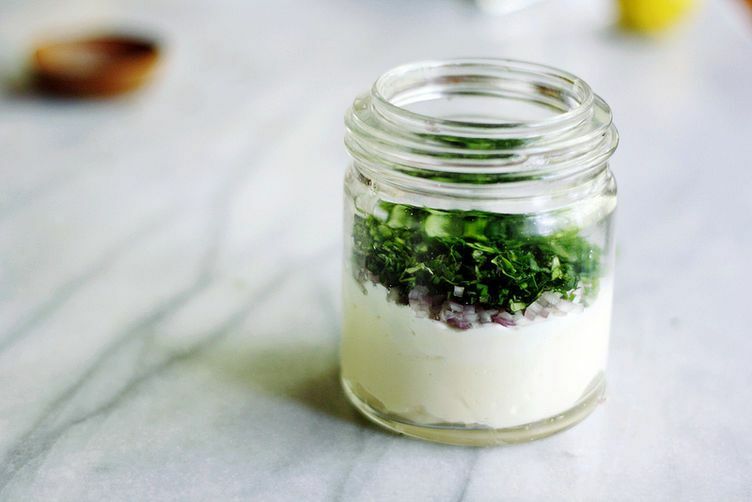 Store any leftover dressing in the fridge and use within a couple of days. Mark Bittman on New York Times adds both buttermilk powder and fresh buttermilk. The comments are positive. I'm going to try this. I like to make this dressing with homemade mayonnaise. After bringing the mayo ingredients to the mayo stage, just add the buttermilk and dressing ingredients to the bowl and continue blending. I've made dressing like this in winter, using dried herbs, and a fresh green onion adds a great fresh taste when fresh herbs are out of season. Blend it in a blender. Add a cucumber and it's cucumber ranch dressing. P.S. I am looking forward to trying this recipe. I love trying new versions! I've been making my own dressings for the last two or three years and can't stand the bottled stuff anymore. For my ranch, I use a combo of buttermilk, mayo and greek yogurt. I add fresh lemon juice, a smashed garlic clove, a little salt, chopped fresh chives and parsley and ... wait for it ... about 1/4 tsp to 1/2 tsp siracha. It adds a little kick and it's heavenly. This is good as sauce for Dungeness crab!!! I have to tell you, this isn't ranch dressing. This isn't just an ordinary ranch, at all. This is superranch--and we're on our fifth jar of it in two months. I'm pretty much in love with it. I added a bit of chopped onion and thickened it up (more sour cream instead of mayo, a little less buttermilk) for a dip for fresh cucumbers and broccoli. I've put it on sandwiches, I've added it to salads and brushed chicken with it before grilling. It's perfect. I'm only moderately obsessed with it now (moderately, really), and you may well have converted me from the ranch-hating side of the fence. That is the best review I could ever hope for. Hip, hip for Super Ranch! whiskeyish, did you just use sour cream in lieu of mayo or just more of the sour cream as needed? Sour cream instead of mayonnaise to use the recipe as a dip. I used the standard recipe for sandwiches and salads, as well as putting it recently--don't judge--on ears of corn, then grilling them, in an attempt to retrieve a bit of summer. BRILLIANT idea with the corn. I love grilled corn, and I might even suggest you then roll it in grated grana padano afterwards. No judgement. Invite me over. Great idea with the corn. Thanks for clarifying the way you made the dressing. So great to see a ranch dressing with no MSG! I'm on my 2nd batch - this one doubled. It's so very good. My hubs said that it's better than any ranch he's ever had, ever! It's really good over all the veg, and even with some crumbled bleu cheese. Thanks - we'll be making variations of this all summer! Thanks to your hubs for the compliment! Happy summer to you. Hooray! Happy to hear. And you know, potato chips are always in season. chips are always in season in our house. We only love Trader Joe's Salt and Pepper chips. Ah, soooo good. Will go out now and buy the ingredients for this dressing. Can't wait to try. Thanks for sharing. Looks like I replied to this post a while ago, but still haven't made it. Completely forgot. Not now. Will make it and write about it. Actually a couple of grape tomatoes or a juicy piece of homegrown tomato blended up in this dressing can add a really nice flavor as well. Great idea! I often serve it over oven-roasted tomatoes, too. I had cooked a stew for dinner but it didn't finish on time and it was too hot and humid for stew anyway. So I made this ranch dressing and served it with cut-up Israeli cucumbers, carrots, radishes, red pepper, asparagus, and baby artichokes. Along with a platter of Serrano ham, that was dinner. We ate out on the deck as the sun set, and enjoyed every bit of this delicious dressing. Double dipping was permitted! Thanks for sharing this with our community. We had quite a similar dinner a few nights ago, for very much the same reasons — it was simply too steamy to cook, or eat a hot meal. Your evening sounds perfect. I'm thrilled to hear that you gave the recipe a try, and even more so that you enjoyed it. Thank you for inviting me to contribute to Food52. I'm wondering how long this will keep in the fridge. I've never made my own ranch before (I know, I know) so curious as to how it keeps. Thanks! While I'm no food scientist, I cannot definitely say in terms of safety. That said, I am personally comfortable keeping mine in the fridge for up to a week. The recipe can be halved neatly, if you have any concerns for storage. Just mixed up a half batch in a Ball jar - had some buttermilk I needed to use up. Really yummy. Serving it tonight drizzled over roasted asparagus. Also consider chopping up some capers and throwing them in. Thoughts? I think that is a great idea to put into err asparagus. And yes to capers. Can't wait to try this.... Tomorrow. Late lunch today. Just had drinks and now dessert. No dinner. Yes to roasted asparagus! You could do sort of like sauce gribiche and have the ranch on the asparagus with chopped boiled egg and your capers. You could even fry the capers until they're crisp and add them at the end. Love the gribiche idea. Maybe later in the week. But just as it is on the asparagus was awesome along with sauteed fish. Thanks for an easy, elegant and versatile recipe. Doesn't look like any I have. Where to buy? Hi! It's a vintage Crown jar, made in Canada, and is actually a 1/2 imperial pint size. I was making a half batch of dressing in the photos. Another look at it here. Ah. Thanks. But I noticed that the one shown looks like it has a clear lid. Sorry, but do you mean the photos shown here, or the ones shown on my site? It's the same jar; the lid is a metal screw with a glass/clear lid. Ok. Here on the site it just looks like a clear glass lid, no metal. I think it's maybe an optical illusion, tastysweet, as there's no lid in the photos here on the site — these jars have pronounced threads, so maybe that's looking like the seam of a lid? In the last photo on my site, you see the jar with the glass lid in place, without the metal ring to secure it. Sorry for any confusion! Gorgeous recipe Tara. I like to add some creme fraiche in mine and here in Dubai, we use laban instead of buttermilk. Oh heck, I just call it dressing, not ranch anymore!! Okay, so crème fraîche totally something I'm going to try. Thank you so much for the kind words. Tarragon is delicious in this. Thanks for the great recipe. I made my own mayo too and it was really really good. I'm thrilled to hear that you enjoyed it! These types of dressings do lend themselves well to variation. Would tarragon work in this in place of the basil and/or parsley? I have a heap to use up. Cheers! There's no reason you can't use tarragon. But you have to recognize that there is a threshold where it stops being ranch dressing and becomes something else. Not that that something else is bad it's just different. Frankly fresh basil has already crossed that threshold for me. Yeah, I'm definitely going for the "something else" version. Thanks! If I can chime in with another "something else" version, fresh dill is lovely. One thing people forget for ranch. MSG. Yup..I know. But was in the original..and instead of chopped fresh stuff..it was mostly dried stuff---it mixes better. Personalty I use a bit of 'Cavender's Greek seasoning' to the mix--which adds the MSG element and some lemon and herb flavorings. It's true, the dried stuff (garlic, onion powder, herbs) in the original are a big part of what gives it the distinct flavour — and I'm a huge fan. Cool Ranch Doritos, anyone? I hoped this comes across as it was meant, as my variation on a classic, not at a try at knocking or recreating the original. I wonder how well it works with powdered buttermilk? I rarely purchase the quart of buttermilk at the supermarket---because I rarely use it until it spoils. I keep powdered buttermilk on hand though---in the freezer. Hmm, Sam, I honestly can't say as I don't have a huge amount of experience with powdered buttermilk; I hope you report back if you give it a try. That said, I've made this with soured milk (lemon juice + milk) and it has worked well when I've not had buttermilk on hand.